Government Employees of Rodrigues island launch campaign against privatization measures that they say will impact people’s access to water and public health services. In Rodrigues, a small island in the Indian Ocean colonized by the neighboring island Mauritus, the Rodrigues Government Employees Association has launched a campaign to combat the privatization announced by the Regional Government in the 2018/2019 budget. Peoples Dispatch spoke with Julienne Meunier, the Secretary of the Rodrigues Government Employees Association and a member of Rodrigues People’s Parliament, to learn more about the impacts that the privatization measures will have on the people of Rodrigues and why they are fighting. Peoples Dispatch: What is the campaign being led by the government employees of Rodrigues against privatization? Julienne Meunier: Following the decision of the Regional Government through the 2018/2019 budget to go forward with the privatization of the running of the different desalination plants which will eventually end up with the privatization of the whole public water services and the privatization of different sectors of the public health services such as transport of patients, security and cleaning, duties normally performed by Government employees, our union, the Rodrigues Government Employees Association has decided to launch a public campaign against this Government decision. The fact that the privatization of these different public services will definitely impact negatively on the population more particularly on workers, the poor, the unemployed and women, we have decided to bring the issue for debate at the level of the Rodrigues People’s Assembly (Parlman Popiler Rodrig in our local language – representing a coalition of community based groups, NGO’s and workers’ organisations actively seeking a better Rodrigues). To hold a public demonstration in case the Government maintains its decision to go forward with its decision. The petition against the privatization project is on-going and the union is also campaigning on the social media using posters and videos against this evil Government decision. PD: What impacts will the privatizations of these key sectors have on the people of Rodrigues? Who will be most affected? JM: Over the years, our traditional public system of water production and distribution has served our people well, where the poor can have access to public drinking water at peppercorn rental. Despite the regular grumble regarding the availability and distribution of water in Rodrigues, it is a fair process which should be improved both in terms of water production, distribution and management. The most fundamental of rights, the right to water and health, thus the right to life cannot be made a commodity. That is, let those who can pay – live, and those who cannot – die. Given the scarcity of water, the socio-economic impact of water and health services privatization on this small island would be disastrous. Privatization of the management and running of desalinated water sector and the different sectors of the health services cannot ameliorate the lot of those striving for adequate drinking water and appropriate health services respecting their basic human rights. No it won’t. In reality, it will bring grief and misery to the poor, while making those who eventually get to own and run these companies – filthy rich. PD: How has the Government justified its announcement? Has it responded to the anti- privatization campaign? JM: The public services that do exist today in most cases are kept afloat by a skeleton staff overworked and undervalued and consequently cannot respond adequately to the needs of the population. We strongly believe that the Government has deliberately refused to improve the public services with the sole intention to put the blame on those providing these public services and used it as an argument to privatize these services. This is why we uninterruptedly campaign for the restructuration of the public service in Rodrigues by providing the financial basis, appropriate structure and equipment as well as necessary human resources as for us it is one of the key solution to the socio economic problem the island is facing and will be also fundamental in the building of a culture of service that can respond effectively to the needs of the Rodriguan people and at the same time set the basis for an equitable, prosperous, democratic and sustainable Rodriguan society. PD: Do you have any upcoming actions? How will the union increase the pressure on the Government? JM: We are actually in the process of contesting the decision of the Regional Government to deny the union of the right to campaign against their decision. 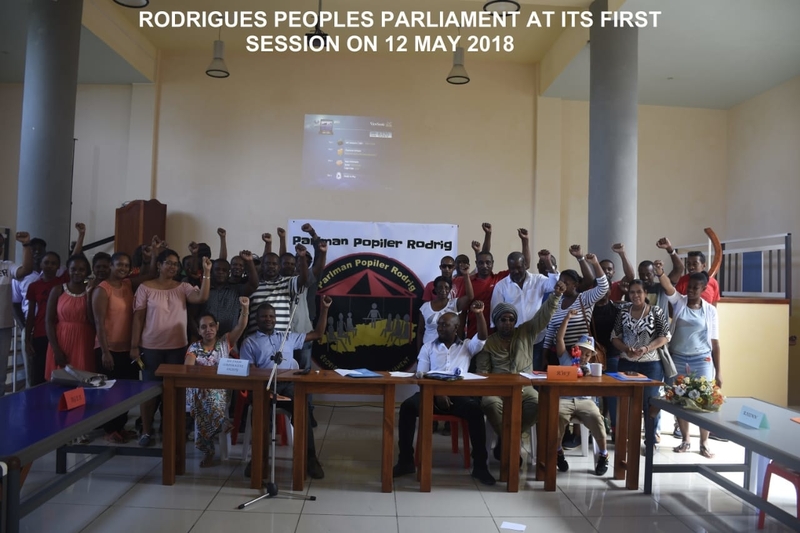 As decided the union together with the Rodrigues People’s Parliament (Parlman Popiler Rodrig) will organize a public demonstration which will follow with other forms of protestation until the Government decides to turn away from privatization and understands the distinct concept of public value –the meeting of social needs as the central criteria for efficiency in the management of public services and start a process of improving and expanding public services through proper re-structuration of the water and health services amongst others to meet the needs and satisfy the human rights of the Rodriguan people. It is worth noting that in 2010 the then Regional Government led by the Mouvement Rodriguais (MR) had then decided to privatize the whole water sector but upon pressure by unions and other Non Governmental Progressive organisation, the newly elected Regional Government took the decision to bring back under the control of the public service. For us here as elsewhere, with privatization, the sharks will move in. Once the privatization frenzy has settled, the people’s inheritance would have evaporated in a puff of greed. Once public water and public health are gone, they’re gone forever. Water which government got hold of in the first place because communities entrusted them with it; to fritter part of it away without real consent is a betrayal of that trust. In the case of our water, and health services, this means giving up control over resources and services upon which our lives ultimately depend, and placing them in a position beyond the laws made to administer them fairly and for us this is unacceptable. Peoples form governments to protect them from this kind of situation, yet some governments like ours are gradually removing the protections they were created to provide. Give Chagos sback to the Chagossians! That’s a slogan I first heard in 2000.